"There is no love among the evil beings in the Negaverse. There is nothing but lies and betrayal. Ruthless creatures out for no one but themselves." The universal battle between good and evil, and unlikely heroines fighting for justice are part of the basis for the Sailor Moon franchise's immense popularity. For its Stateside release, DiC, a subsidiary of Disney, made many modifications to the original Japanese version to tone down any of the more mature content, to make the series more marketable to young girls. With its blend of silliness, action, and triumphant morality, the show does appeal to a broader audience than its original target. Like many series, there are several animated sequences rehashed on a weekly basis, such as the transformation segments that precede every showdown. However, they do manage to fit these repetitions in without feeling too cumbersome, or slowing the pace too much, and Serena's trademark soliloquy gets a fresh spin each time out. That evil Negaverse just won't go away, but the trusty Sailor Scouts are out to thwart their plans for taking over the universe. 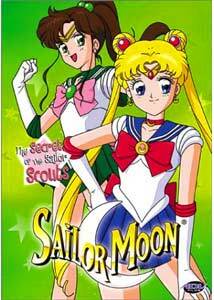 Disc four of the DiC translated version brings another six episodes, and adds a fourth Scout to the team, with the arrival of Sailor Jupiter, and just in the nick of time. Neflite's failures are beginning to catch up with him, as he hasn't been able to solve the problem of the Sailor Scouts. Even masquerading as Tuxedo Mask had him barking up the wrong tree, when he assumed Molly was Sailor Moon. Unfortunately for the real Sailor Moon, her best friend, is now in love with a minion of evil, despite being warned that Neflite is a really bad guy. Time is ticking on Neflite's chances to recover the lost moon crystals, before he, too, becomes Negawaste under Queen Beryl's unforgiving command. As the series progresses, and as the disc title suggests, more is laid out as to the origins of the Sailor Scout's powers. The characters are also beginning to figure out who their alter personalities really are. Neflite's plot to expose the girls also brings Tuxedo Mask out of anonymity, but as competition for the crystals heats up, it is unclear which side he is really on. As expected, the ante is upped as more powerful monsters are conjured to fight the Sailor Scouts. It is left to them to put aside their personal differences and fight as a team, as a new adversary makes the scene. While the plot is pretty formulaic, the character strengths and relationships manage to keep thing light and interesting. The twists brought in on this disc look to provide new conflicts down the road. Serena is still the center of attention, and her combination of jealousy, romantic illusions, and awkwardness make her the strongest character so far. I do have a soft spot for Luna, the condescending talking cat whose job it is to keep the Scouts focused on their mission. Without her guidance, Serena would be locked away in front of a Sailor V video game. Image Transfer Review: Video quality is consistent with previous releases, both in strengths and weaknesses. Overall, the series looks very good, with strong colors, good black levels and few source defects. Saturation isn't as vibrant as more recent shows, but this is the look that is expected. A bit of cross-coloration, and typical amounts of aliasing are the only real faults to be found. Audio Transfer Review: I remain impressed with the audio quality for a show this old. The sound is full-bodied with strong low frequency content. Voices and dialogue are presented well, clear and easy to discern, with no abrasiveness or peakiness in the equalization. Extras Review: Extras are limited to ADV previews for Dirty Pair Flash, Monster Rancher, Medabots, Sakura Wars, Shadow Raiders, Reboot, and Princess Nine. Menus remain similar in layout and operation, with a different background picture. Five chapters are in each episode, with only the first menu accessable. Even with its predictability, Sailor Moon still manages to conjure up enough freshness to keep interest in the series alive. As things become more complex, and new characters emerge, the show keeps piecing out an underlying plot within the framework of its episodic storylines. Joined by Sailor Jupiter, our heroines continue to battle the forces of evil, while trying to remain civil to one another. Teamwork and commitment to a cause remain a constant thread within the series.